Abigail Stevenson seizes every opportunity to expand the CMU educational experience that her ACS Legacy Scholarship makes possible. Her experience includes the exceptional education she craved. 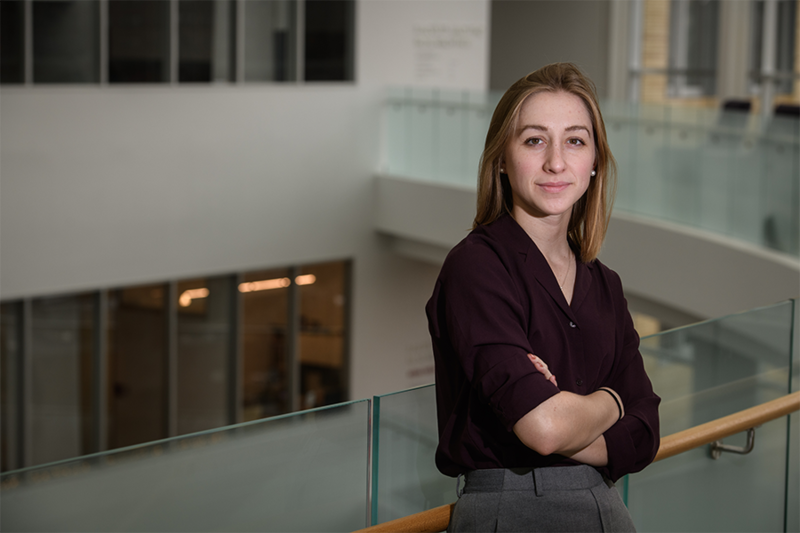 A business administration major in the Tepper School of Business, Abby is active in two organizations within the school’s Finance Group ― the Investment Banking Academy and the Tartan Student Fund, where she is a portfolio manager. In summer 2018, she interned as an investment banker for Bank of America in New York City. Service is a big part of Abby’s CMU experience. As a member of Alpha Kappa Psi, CMU’s co-ed business fraternity, she served as service chair, organizing an expanded Service Day of outreach to groups in the Pittsburgh region. The fraternity also raised $400 for a donation to the Tree of Life Synagogue while continuing their yearlong fundraising for a $1,500 college scholarship that will be awarded to a Pittsburgh high school senior. “Service chair was one of the most time-consuming positions I’ve held here, but one of the most rewarding,” she says. CMU has also given Abby the opportunity to resume her passion of dancing. Growing up a few miles from Penn State University’s main campus, with her mother employed there and two alumnae sisters, PSU may have seemed the logical choice, but, Abby says, “CMU felt so right. Abby is certain that, without her ACS Legacy Scholarship, she would not be a Carnegie Mellon student. That scholarship put her CMU education within reach. She is sure she would not be as happy and self-assured as she is if she weren’t at Carnegie Mellon. “I knew from the start CMU was where I would feel natural being myself, so I would grow personally, professionally and academically,” Abby says. Learn more about the Andrew Carnegie Society and ACS Legacy Scholarships.